If you’re having trouble processing a payment, be sure you’ve updated the app and you’ve tried these app troubleshooting tips. If you’re still having trouble, contact us for help with a specific transaction. We’re not given an exact reason a card is declined. If your customer has confirmed their card is valid and the transaction still declines, they should contact their card-issuing bank for more information. 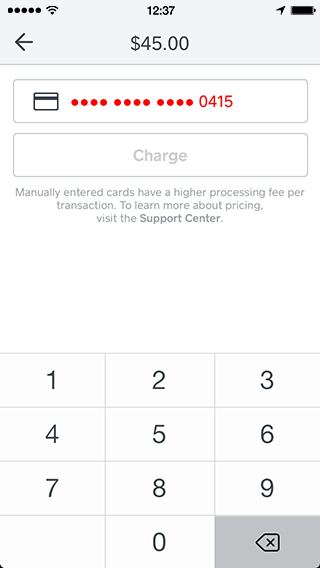 For manually entered transactions, Square requires 100% accuracy. The information entered must match the payment card exactly. If your customer has recently moved, the billing ZIP code entered may be outdated. If you’re manually entering a third-party gift card, the customer may need to contact the card issuer to register the card with a billing address, which is required to manually enter any card. Tap Settings > General > International > Calendar. Log out and log back into the Square app. Note: Declined cards may result in pending charges on your customer’s bank statement. Square immediately sends the void notification, but it may take the bank a few business days to remove the charge. A card’s numbers will turn red if the information entered is incorrect. Verify with your customer that the information you’re entering is valid. 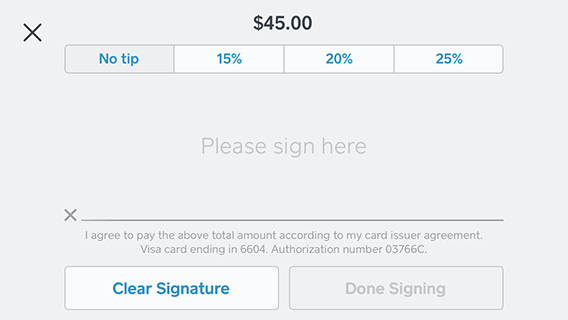 If you accidentally charge the wrong amount, you can cancel the payment by tapping the X in the top-left corner of the signature screen. You can require a passcode to cancel transactions. Square requires an active Internet connection to process payments. This can be either a Wi-Fi connection or a data service (such as 3G, 4G or EDGE). Choose Wi-Fi over your cellular network for a faster processing experience with Square. Mobile devices display a list of Wi-Fi networks in range. Tap a network and, if necessary, enter the password to join. If no Wi-Fi networks are available, your device may connect to the Internet over a cellular data network (EDGE, 3G or 4G.) You can prevent your device from using cellular data in Settings. Always check that you have a strong network connection before attempting to process a payment. Payments can fail if the connection is not strong enough. Note: If you lose internet connectivity, you can enable Offline Mode to accept swiped card payments. When operating in Offline Mode, there is additional risk with any payments you accept. If you accept Cash or Other Tender without an internet connection, you may see a list of uncompleted payments in-app. The payments will be recorded when Wi-Fi or data service is restored. This only applies to Cash or Other Tender processed with the Square app. If you process a Square Gift Card payment and the balance doesn’t cover the full amount of the sale, you’ll need to click Done from the signature screen to continue on to process the entire sale amount. If you don’t process the entire sale amount, the sale will be voided. If a payment is canceled, interrupted, or declined, your customer may see a pending charge on their card statement. It may look like the charge has posted to their account, but it should fall off after a few business days. Square sends a void notification to the bank as soon as a payment becomes voided. It’s then up to the bank to release any hold on the cardholder’s funds. If the transaction does not show up in your payment history, but appears on a customer’s card statement, this is a sign that your customer is seeing a pending transaction and not an actual charge. A payment is not completed until you’ve passed the signature and confirmation screen and processed the full amount of the sale. If there is a remaining balance on a transaction, it will need to be processed for the entire sale to be successful. Offline Mode payments will complete if you regain internet connectivity within 72 hours, assuming the card does not decline. If your payment was successful, Square will send you a notification email (e.g. “Square Payment #123456”). Confirm a successful transaction by checking Transactions within the app or your payment history in your Square Dashboard. If a transaction is not completed, it will appear in your Transaction Status report. If you have questions about deposits, check out these troubleshooting tips.